It’s All About The Grandeur! By definition, Grandeur means splendid & impressive – designed with exceptional style & appearance. We define grandeur as the way that our Taj Mahal looks when installed in an exceptional backyard (as seen above). Seen above, the Taj Mahal is an exceptional fiberglass swimming pool that exhibits both splendor & majesty. If you’re a doer and a talented landscaper who wants a large lagoon on a grand scale – the Taj Mahal is perfect for you! Both large and beautiful, you can blend it into a scenic backyard and create a natural look not found elsewhere! To maximize the Taj Mahal’s features, we suggest partnering with a talented landscape designer. 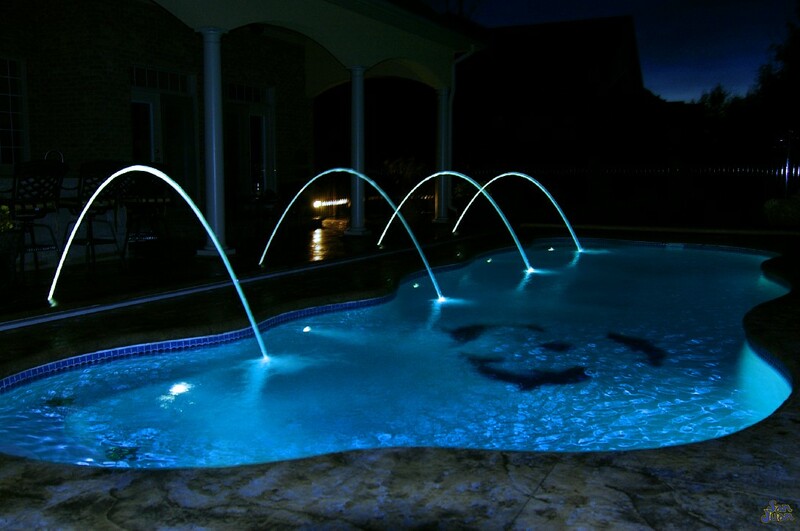 Doing so will create a backyard that compliments the natural flow of this free form design. The shallow end of the Taj Mahal includes a curved set of entry steps. 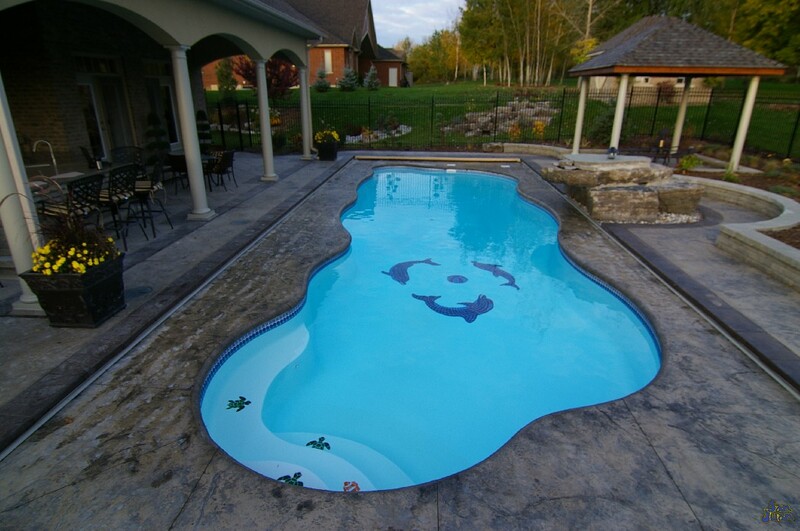 Designed to create a smooth entry point into the Taj Mahal, this feature allows our clients to get a little creative in their design and construction of this swimming pool. For example, the above image features a Beach Entry layout. Our client decided to maximize the style of the Taj Mahal to create a serene lagoon that to casts all cares aside and rest in nature’s external beauty. 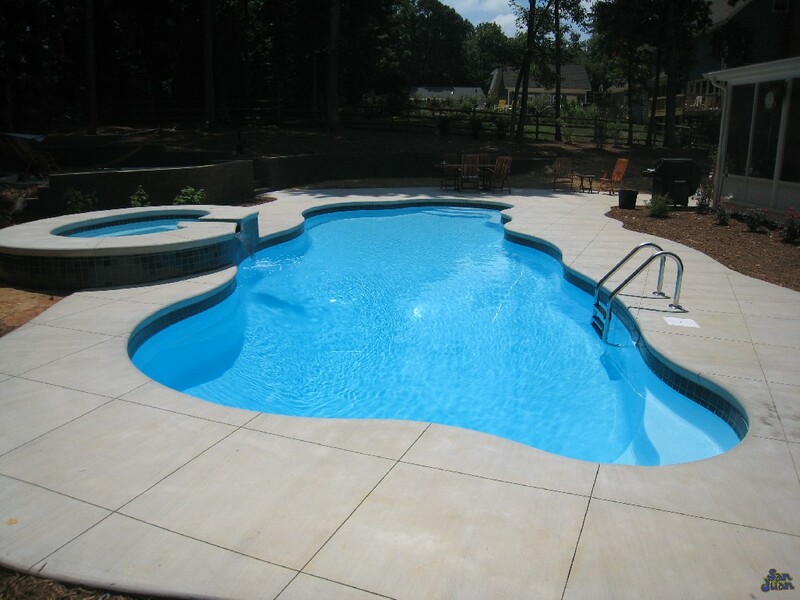 This fiberglass pool blends brilliantly into surrounding landscapes and looks most stunning when combined with multiple landscape and architectural features. The image above showcases the Taj Mahal with a concrete beach entry and zero edge border – overlooking the town beneath it. This is a Large Swimming Pool designed for large backyards due to it’s whopping length of 45′ and water volume of 18,000 gallons. 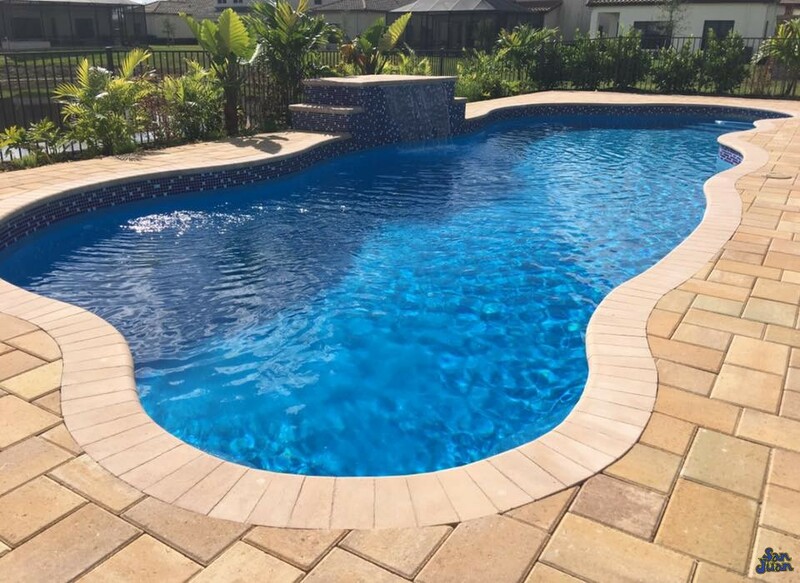 We suggest pairing this pool with smart phone automation and the occasional accessory, such as a water slide or volleyball net to enhance it’s ability to entertain large crowds and guests. In conclusion, the Taj Mahal offers a wide array of attractive features for our clients. From its 6′ 4″ deep end, 18,000 gallons to a total surface area of 560 SQFT – this is a huge swimming pool that maximizes your outdoor fun! You can pair this amazing fiberglass pool with one of our San Juan Spas for an added feature that will greatly extend your swim season! However you decide to construct the Taj Mahal this is a brilliant swimming pool that you’re sure to love for years to come!